“…I’ve gone through a lot of changes over the last few years. Some were controllable, and some were not. I went from having a record deal to being an independent artist, and figuring out how to do this on my own. On some level I felt I went backwards a few steps. Maybe I did, maybe I didn’t but at the end of the day I was freed up to make music how I wanted and not have to worry about anything but creating the art that I believe in. For me this feels like a step forward. I might not have marketing budgets and radio support, but I am really only looking to find ways to make enough income to support my family and live out the passions that burn brightly within. Chasing the dream or what ever you want to call it. The hardest part though is figuring out a way to survive, create and live in community. One of the most underrated singers and songwriters in the music industry today, Shawn McDonald is no stranger to stardom. Having originally signed to Sparrow Records, he released plenty of albums, only to go dark in 2015. With his star power on the rise, with hits such as “Closer”, “We Are Brave”, “Captivated”, “All I Need”, “Gravity”, “Free” and “What Are You Waiting For” all gracing the radio airwaves and our ears at one point or another; I for one was puzzled and perplexed that he seemingly disappeared from social media and the music industry a few years ago. Yet now Shawn is back. After a hiatus that seemingly refocused his energy into making the best music that he possibly can, The Search is the result- an EP of 6 songs that is part 1 in a 3 part series, as Shawn releases his first independent project and asks more questions of the world in these melodies than ever before. One of the most underrated EPs to release this year, this batch of heartfelt, personal and honest melodies are sure to inspire and encourage- and you will definitely love these tunes if you’re a fan of artists like Jason Gray, Nichole Nordeman, and Shane And Shane. “Great Big World”, sung to his children, is first, and off the bat is as personal as ever. As Shawn relays to his children about how he met his wife, and the many adventures that he has had with her; he mentions in the chorus to his children that ‘…it’s a great big world outside and you might see it with your own eyes…’. As Shawn shares with us the simple yet effective notion that even though we are scared to venture out into the world when we’re young, advice from mentors and friends and family and acquaintances are sure to dispel any doubts as we walk into the world, fascinated, in awe, but prepared for whatever may come at us; we are introduced to a hard-hitting opener setting the stage for the rest of the mini-album. Led by up-tempo acoustic guitar strums, “Fight For You” is a personal melody sung to his wife, as Shawn imparts that he will never stop fighting for her- similar in concept to Grayson Reed’s single of the same name; while lead single “Place Of My Own”, a personal album highlight, asks the age-old question of why do we feel alone even when we’re surrounded by people, and so-called friends. It’s a conundrum and a dilemma that will keep going until the end of time, as Shawn tries to reconcile having people in his life compared with going off by himself and trying to find a place of his own. “Naturally” follows, and is another personal standout, with Shawn ardently relaying to us the fact that falling back down and getting up again, learning from hardship, and becoming better people as a result, comes naturally to him, and should to all of us as well- just like breathing, thinking, dreaming, dancing, and every other thing we do in our spare time. “Burning”, the penultimate track on the EP, plays out like a Jesus Culture song, and earnestly speaks about how on fire for Jesus he is, and how much he longs to see Jesus in the future (aka, in heaven!). Then, as much as I have come to be impacted by this EP, the track list finishes, as “Cold Winter Snow”, a sombre, reflective, 2-minute piano led prayer to God, asking Him to come close and help us in our daily walk. As a closer, this melody really hones in and personifies as to what Shawn’s EP is all about- searching for God amidst the rubble as asking Him to comfort us in times of hardship. “…These songs are personal glimpses into my world. They’re meaningful to me and help me deal with this thing we call life. They are songs that I write to my wife, my children, my friends, my family, and the search to find the meaning and value of life as I pursue what it means to know and love the creator of this beautiful world. I don’t believe life is always good cause just stick around for long enough and you will taste plenty of bitter things. This is a place of honesty and if I choose only to talk about the good things then we give a false sense of what life truly is. Life happens, sometimes it’s beautiful and sometimes it straight knocks the wind out of us. If you are still reading this then maybe you feel the ache as well. A subtle stirring within! a need for something different, or maybe just something healthy and true. This ache is real and I would go as far to say it is alive in all of us. If you don’t feel it then maybe try stepping back for a sec and asking yourself a couple questions. Why am I here? What does it mean to truly live? Where did we come from? The answers to these questions differ for every human you ask. Sometimes we numb ourselves so much we can’t feel what is really happening around us. You might not even know you’re doing it or maybe the wound is so deep the last thing you want is to face the very thing that is hurting you. All these things are things I wrestle with and ask. I don’t know if I will find the answers, but God knows I will try. 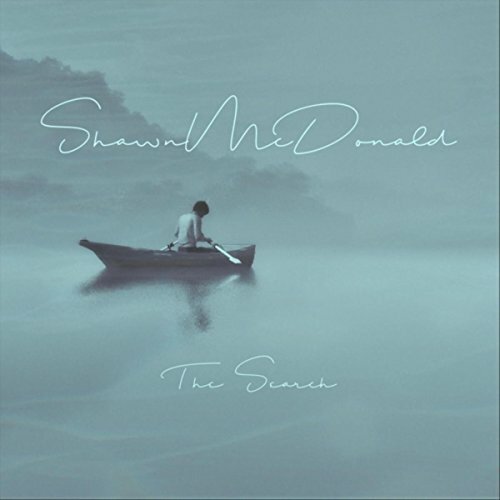 In essence, Shawn McDonald’s The Search is pretty bleak and musically ‘depressing’ if you think about, however such a reflective EP is needed in today’s political and economic climate, as we wrestle with many different issues. While it’s not known when Shawn’s next two EP’s will release, hopefully, it will be musically more upbeat. Yet until that time we have this EP- a comeback from Shawn that is much appreciated as we remember everything that God has done for us and grapple with that as well. So what are you waiting for everyone? Check out The Search and hopefully you will find something meaningful.